Editor’s Note: This stunning, lacy scarf uses just under a skein of silken yarn and is worked in a zizag that flows naturally as the pattern is knitted. Optional beading, featuring gunmetal and olive gold-lined beads, adds a classy designer’s touch. I was thrilled to receive Kristina’s kind permission to share this with you. Enjoy! Yarn: 250 -400 metres of DK weight silk or silk blend. The yarn used here is Silken by Handmaiden. I used a bit less than one skein (100 g or 250 m). Needles: 4.0 mm straight or circular, your choice (I used circular). US size – either 5 or 6 – I’d likely go with the larger ones first. Beads: 1250 beads in 6/0 weight. I used beads by Earthfaire in two colours – 750 in gunmetal and 500 in olive gold-lined. I imagine that you could get away with half the amount of beads if you really want to – but I like the full line. Notions: bead threader or dental floss threader (for threading beads), tapestry needle (for weaving in ends). The pattern is heavily inspired by Sivia Harding, who created the wonderful River Rock Scarf (that pattern is found in the No Sheep for You book). The zigzag pattern is modified from one published in a “Lace Primer” article by Eunny Jang in the Interweave Knits Summer 2006 issue. Finished size: approximately 40″ long by 5&frac12 inches wide. 1. Thread the beads directly on to the yarn before you begin knitting. Use either a beading needle (available at bead shops) or a dental floss threader (available in quantity at most pharmacies). I used the latter. 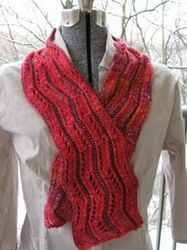 There is an excellent tutorial on how to do this by Sivia Harding in the Knitty Spring 2006 issue. My further suggestion: to save yourself hassles while knitting and minimise having to push the beads down, when you have approx. 40 or 50 beads in a group, push them down several metres and keep doing so, keeping several metres’ distance between each group of beads. I don’t think the crochet hook method of placing beads will work well with this pattern – but please do correct me if you find out that I’m wrong! (I know you’ll be shocked at that notion, but it’s been known to happen!) Of course, you can always skip the beads. However, I quite like them. Cast on 30 stitches loosely (I used the cable cast-on method). The pattern is repeated over 20 rows – the entire scarf as I knitted it is 250 rows long, with a half repetition at the end of the scarf. Knit the pattern:Rows 1, 3, 5, 7, and 9: P1, PB, *P1, ssk, K2, yo, K1, P1, pb* then repeat the part between the asterisks three times, then last stitch P1. Rows 11, 13, 15, 17, and 19: P1, PB, *P1, K1, yo, K2, K2tog, P1, pb* then repeat the part between the asterisks three times, then last stitch P1. The pattern, when knitted, zigzags naturally, as shown in close-up photo, above. Repeat Rows 1 through 20 a total of 12 times, then repeat rows one through 10 once = 250 rows. Bind off LOOSELY (if you knit tightly, or you’re just beginning, it might help to bind off with a needle one or two sizes larger than what you used to knit the scarf). AUGHGHGHGGH! How do I place beads, you ask? Simple. The beads belong between the stitch preceding the “pb” notation and the one following. Just push one bead as closely as you can to the base of your working yarn, then knit or purl the following stitch as directed. Don’t worry if the bead appears loose – everything will fall into place eventually. I use spray blocking for this type of piece. Grab a towel and place on a blocking board (or, if you’re like me, the floor on top of a towel). Spray the scarf generously with water from a spray bottle, then flatten out and ensure that all of your little peaks are looking perky and that your beads fall into line. Spray some more and then leave to dry. It won’t probably be the end of the world if you want to do a wet blocking by soaking with water with a bit of mild detergent, shampoo or Eucalan instead. However, I don’t vouch for that as I haven’t tried it… I would just say be gentle as silk can stretch dramatically.